As we cycled to the library this morning, a couple of encounters made me realize once again how people tend to sabotage themselves with their beliefs and speech. Two words, “worried” & “afraid”, gave me an insight into her life. Both powerful words that will draw more of the same to her. She then proceeded to tell me how she was always afraid to leave her bike because of the expensive Bionx kit. I explained the principles of the Law of Attraction and how she was likely to draw the very circumstances she was so afraid of if she kept maintaining that thought pattern. The blank stare told me she didn’t get it so I told her about a security code she could enter into the Bionx system to disable it. The second encounter was with another cyclist outside a grocery store, who wanted to know about recumbent bikes. Later, we met him again as we waited in a very busy intersection to head home. He gave us the url for a website and said to be sure to look at the “10 Ways of How Not to Get Hit By a Car” article. My first thought was that the best way is to get that thought right out of your head. I immediately turned onto a sidewalk and towards a path less travelled. Knowing how these energies work it made me uncomfortable to see where his thoughts were going while standing in a place with so much traffic. 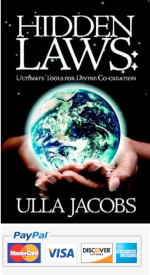 Awareness of these principles of Universal Law allow us to use them for our benefit instead of for our detriment. However, the awareness first needs to be there before we can use these timeless laws.